Over 300,000 people have enjoyed Pageant of Our Lord. 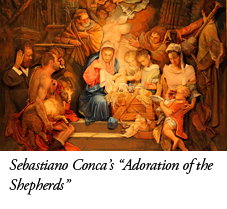 Each presentation includes at least fourteen art pieces, magnificent orchestrations with a 60-voice choir, and original narration to lead the audience on a unique journey through Christ’s life. Over 400 volunteers donate hundreds of hours each year to bring this unique gospel presentation to believers and non-believers alike. What is now an established and highly organized tradition began as an idea in the mind of Dr. David Halverson, producer and music director. In 1980 he saw the Passion Play at Oberammergau in Germany and was moved beyond words by the tableaus of that production. He began to imagine a passion play to proclaim the life of Christ to the communities of the South Bay–not every ten years like in Oberammergau, but yearly at Easter time. He had also seen Pageant of the Masters in Laguna Beach, California, which used live models as human figures in famous paintings and sculptures. Why not combine the two? Create something like Pageant of the Masters, but make it about the life of Christ? So, in 1985 Dr. Halverson gathered a group of artists to consult with the team of artists and directors of Pageant of the Masters to gather information regarding lighting tips, makeup and models, and sets (without the models) with their special armatures and cutouts. 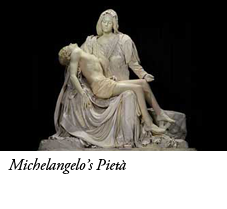 With the information they created six reproductions of classical art depicting scenes from Christ’s life for the first performance, one of which was Michelangelo’s Pieta, pictured right, which is the only one of the original six that has appeared in every performance since then. In the following years, scripts were used to present narrative or dramatic evangelical messages along with the art and music. This combination provided the audience with an experience that was both historic and spiritual. Advances in the technical and art departments began to take shape to allow for the increasing number of art pieces that crowded the backstage area and the growing dreams of volunteers and models. The makeup room became the center of activity on presentation days, with spray painters and makeup artists transforming models into characters depicted in art pieces, and still continues to be the center today with an army of volunteers guided by prayer and total reliance on the Holy Spirit. Today there are no fewer than fourteen pieces of art in each performance, a much larger number than the original six in 1986. There is also a new outreach, a special performance for children in grades 1-5 named “The Story of Jesus in Living Art.” It was first presented in 2010 to a full house of mostly children, featuring free admission, follow-up materials, and outdoor displays of the makeup and production process. Most participants, including narrators and singers, are children. It has become a yearly tradition. Since its noble roots, Pageant of Our Lord has developed into a magnificent presentation that continues to amaze audiences not only at Rolling Hills Covenant Church where it first began, but in three other locations: at Bob Jones University in North Carolina in 1990, in Walnut Creek, California in 2010, and in Beirut, Lebananon, in April 2016. The entire Pageant team of 400+ members at Rolling Hills Covenant continue to pray each year for God to reveal His will and show the way for Pageant of Our Lord to continue to touch lives throughout the world for years to come.